Three stunning tricks that defy the laws of gravity! Imagine being able to turn an open bottle of soda upside down and leave the liquid suspended inside! Then take the trick one step further by inserting small objects into the mouth of the bottle and watching them float inside of it, without spilling a drop! Or what about placing two glasses mouth down on an unprepared book and having them stick to it like magic. The glasses and book can both be examined. 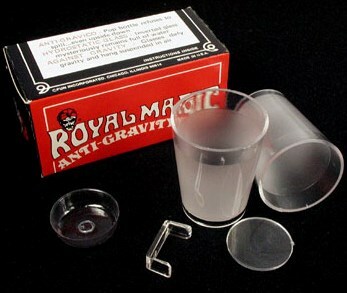 With this set of gimmicks, you'll also be able to turn a glass full of water upside down without fear of spilling it! The Anti-Gravity Trio comes complete with all gimmicks necessary to perform these incredible tricks, and detailed, professional instructions.